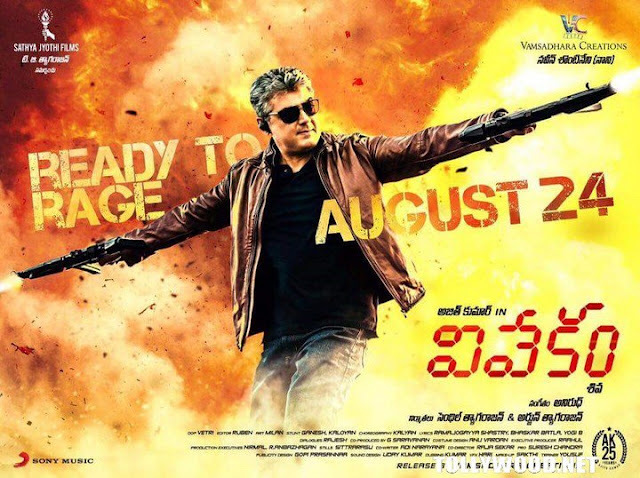 One of the most anticipated movies coming up very soon is Thala Ajith's Vivegam, releasing as Vivekam in Telugu. Starting Thala Ajith in his fittest avatar ever, as he teams up with director Siva who has given him two blockbuster like Veeram and Vedalam earlier, the film is being released by CineGalaxy Inc, the leading distributor of Indian cinema overseas, in North America, and the team has planned a very elaborate release on 24th with grand premieres on 23rd. A humongous release in over 160 screens has been planned with ticket bookings opening up by Tuesday. Thanks to the interesting combinations in the film and some amazing casting, there's a lot being talked about Vivegam. While The diva Kajal pairing up with Ajith for the first time is a huge lure, everyone is also talking about Vivek Oberoi's presence in the movie and how it's going to add a fresh appeal. Akshara Haasan's badass avatar is being talked about a great deal too. A jet reason for the phenomenal pre-release buzz is surely the high technical values of the film with music by Anirudh Ravichander and cinematography by Vetri. Watch this space for more interesting details and catch the movie at your nearest theatre on August 24.